DurableToys.com or Wagon Train Ventures, LLC, is a a "Mom-run" family business owned by Rosemary and Michael Imrick, parents of ten children through birth and adoption. Adoption "runs in the family" for both of us, and we are now the third generation that has adopted either domestically or internationally. Our eldest teenager arrived in May 2012; our 16-year-old son arrived home in March 2014, and our 18-year-old son arrived home in July 2015. We took over this business from family with the goal of supporting our plans to adopt debt-free, and then expanding the business so we can help other families to do the same. We are pleased that this business gives us the opportunity to branch out from our usual work as an IT professional and a university English composition instructor, and thereby the means to touch our world in life-changing ways. Every purchase in this store not only supports the craftsmen and companies who make our durable items, it also supports our family's goal to adopt and to provide for the educational needs of the children already home. Wagon Train Ventures, LLC is the next chapter in the 20-year history of quality toys and service on which Rosemary’s uncle, Dave McCusker, Jr., built the sterling reputation of his toy business. The McCusker family ventured forth as pioneers in Internet commerce in the 90’s and rode the cusp of the Internet commerce wave with the DurableToys.com website. As the second generation in the toy business, we are building on the time-tested McCusker model. In the McCusker footsteps, we search out durable toys for your children and ours. We carry toys made in the USA if at all possible, with a focus on tricycles and the quality wagons made by Amish craftsmen. 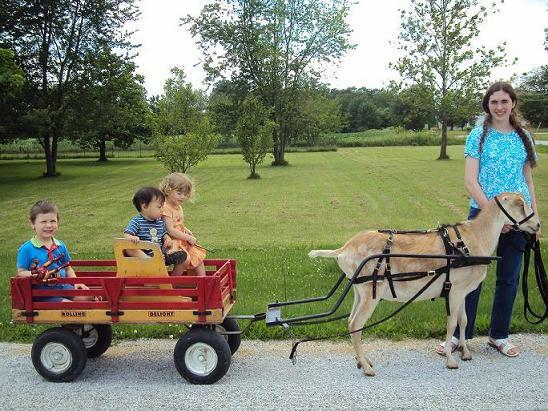 Amish wagons are a particular interest since Rosemary grew up using an Amish wagon as a goat cart. That wagon is still going strong many years later, as shown in the picture of Rosemary's younger sister now using it with her trained cart goat, Sunflower. For those items we cannot find made by our neighbors in the U.S., we look to quality manufacturers who make their items without taking shortcuts on quality, and without exploiting their hired help. We endeavor to work with talented crafters who are paid fair trade prices for their handiwork. You will find country of origin noted in the description of items we sell.